Rochas Okorocha, chairman of All Progressives Congress (APC) Governors’ Forum, says no governor will defect from the party again. 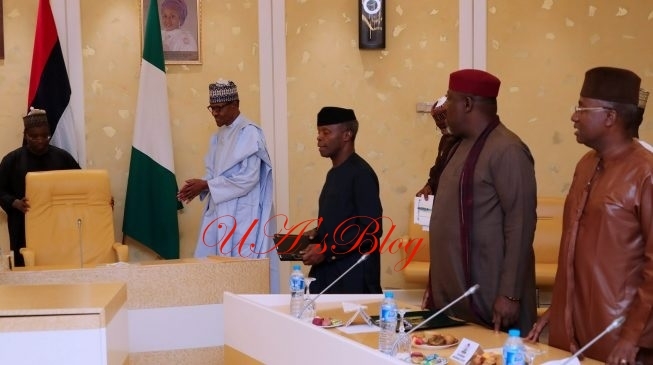 The governor gave the assurance at the end of a closed-door meeting between President Muhammadu Buhari and APC governors at the presidential villa on Wednesday. “Two of our colleagues left our party. This is politics, it is unfortunate that they have to go,” the Imo governor said. Adams Oshiohmole, APC national chairman, also spoke on the outcome of the meeting, saying the governors were on a solidarity visit to President Buhari. The governors who attended the meeting included Abubakar Badaru of Jigawa, Akinwunmi Ambode of Lagos and Yahaya Bello of Kogi. Others were Jubril Bindow of Adamawa, Kashim Shettima of Borno, Atiku Bagudu of Kebbi and Abiola Ajimobi of Oyo. Also at the meeting were Ogun state governor, Ibikunle Amosun, Simon Lalong of Plateau, Abdullahi Ganduje of Kano and Sani Bello of Niger.